All the high-quality capture features of a Topaz signature pad with the added feature of an LCD interactive display. 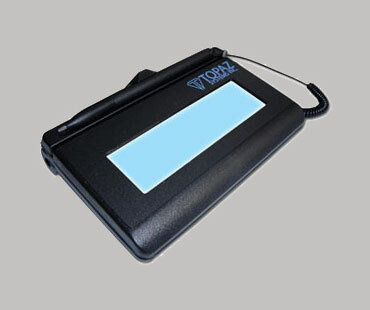 Topaz Systems’ LCD pads feature a Topaz® electronic signature pad with the added feature of an LCD interactive display, allowing users to see “electronic ink” under the pen tip as they sign as well as navigate and display text and graphics. LCD pads will show the signature on the signature pad, as well as the computer screen. All pads are bundled with SigPlus® electronic signature tools, applications, plug-ins, demos, examples, and support. The SigLite® LCD 1×5 models are Topaz’s smallest, low-cost, pressure-sensitive electronic signature capture pads. Featuring an LCD touchpad and stylus, these models show the signature on the signature pad, as well as the computer screen.